I’m not really sure how it happened. I tried to eat all kinds of exotic and ethnic foods while I was pregnant and I continued to do the same while I nursed my son — despite the fact that I could not have any dairy because he had an allergy. I gave him all kinds of “cool” foods during his initial food experiences early on (like avocado, spicy things, olives and other strongly-flavored items) — which he gobbled right up. And now? Now that he is 4 years old, I have the world’s pickiest eater on my hands. Literally. If I didn’t know better, I would bet my bottom dollar that he’s been on a dedicated fast since he was about 2 years old. Did I create a monster somehow? Is it because I don’t eat red meat and I didn’t give him any meat at all until he was about 3 years old? Or is it because I did the unthinkable and caved-in to the idea of not sitting at the dinner table together every night — but rather, cooked a separate meal (to his liking) each night? OR… is it as the pediatrician said? 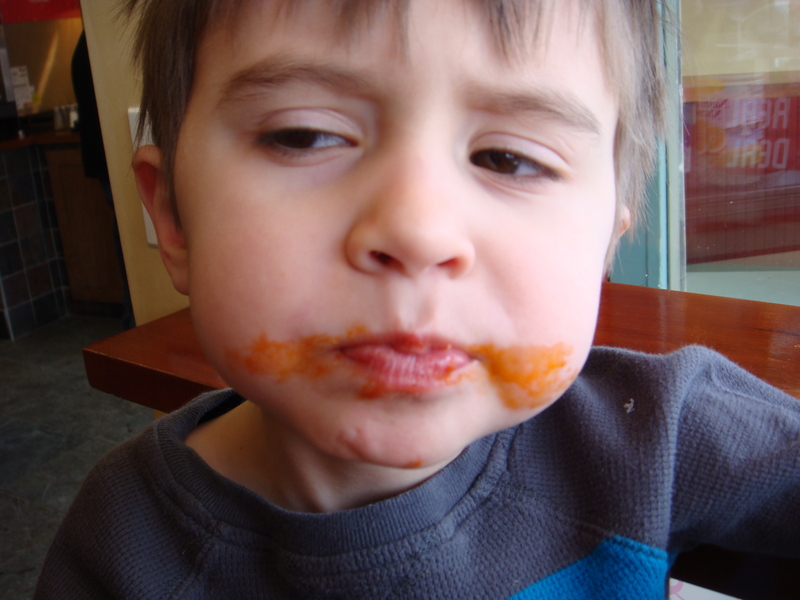 “Some kids are just picky eaters… and, if by the time they are 3 they are still not expanding their food horizon, than chances are you will have a picky eater on your hands until the child is 6 or 7.” Gulp. 1. Pancakes and fruit for breakfast (this is a new thing, he only tried pancakes for the first time ever about 1 month ago — before that, it was the same breakfast bar, every morning, for over 2 years). 2. For lunch? Those premade peanut butter and jelly sandwiches (Uncrustables) with an assortment of snacks, like fruit, cheese, crackers and pretzels. 3. Dinners would be pizza… every night. So I generally call Deno’s up on Monday and have a large cheese pizza delivered. It feeds him the rest of the week. I’ve heard from some other parents that this list is quite good… that their child only ate yogurt for the first 3 years of their lives or will only eat PB&J for every meal right now. I don’t care about other kids though… I care about my kid –the son of a food writer and self-proclaimed foodie! So what to do?? I’v tried letting him look through cookbooks, with the premise that he can help mommy make the grocery list, go shopping for the ingredients and cook whatever meal he picks out. He can never find anything that looks good though. His blanket answer? “No thank you mommy”. Well, at least the kid is polite about it — I’ll give him that. I’ve tried implementing the “no thank you helping”… an outtake on something I had to deal with when I went to Girl Scout camp. You didn’t have to eat something you didn’t like, but you had to try every thing on the menu… even it was a “no thank you helping” (basically a miniscule portion). That has been working okay — but only with bribes: “If you eat just one teeny tiny bite of spaghetti, you can have candy after dinner!” Yeah… that’s a good method.